Following controversy regarding the obvious elbow on Wigan’s James McCarthy during Manchester United’s 4-0 victory at the DW Stadium on Saturday, it has emerged that Wayne Rooney has escaped punishment for several other violent outbursts. Most tellingly of all, last close season he travelled to Nevada after watching the Johnny Cash biopic Walk The Line. Wanting to actually echo the sentiments of the song, he found a homeless man and as friends and family gathered around he tied him up and shot him point blank in the face. 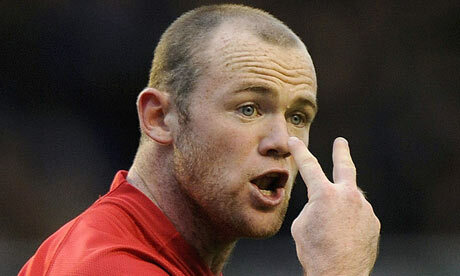 Police were aware of this but apparently Rooney had special dispensation to do this.